I feel like I found a diamond-in-the-rough with the Willow Heights Trail! 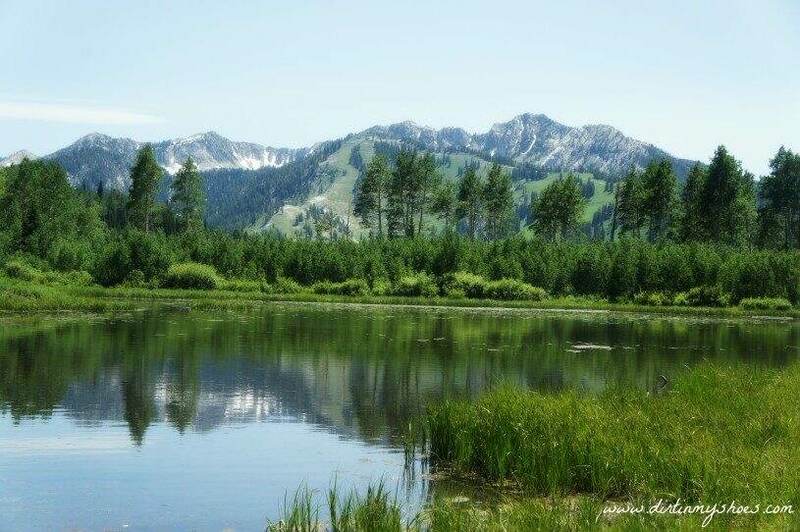 Located up the busy Big Cottonwood Canyon near Salt Lake City, this trail travels through aspen forests to a lovely meadow and a small lake with killer views of the mountains. This trail is often overlooked because of other trails in the area (such as the Brighton Lakes) but it is definitely worth your time. Why do I love the Willow Heights Trail so much? First, the views are spectacular. Second, there are no man-made structures such as dams or ski lifts that can be seen from the trail. Yes! I’m so happy. Third, this trail is not as busy as many other trails in the area. Fourth, meadows full of wildflowers abound (mid/late June through early August). Fifth, you can take your family on a challenging hike that is still kid-friendly. The Willow Heights Trail is 1.5 miles round trip (with the option of adding more mileage if you take the loop around the lake). Although the trail is short, it is quite steep so be prepared with plenty of water and good hiking shoes. The aspen trees do shade a good portion of the trail (thank you!) so the hike along the way is quite pleasant. Be aware that moose do frequent the area so be on the lookout for wildlife. I don’t want to deceive you…the lake at the end of the trail is small. I wasn’t disappointed with it though. The way it reflects the distant mountains and how still and serene it is provides a lovely destination. I have seen pictures of the lake when it is MUCH smaller than in my pictures. Mine were taken in the middle of June and the wildflowers were blooming too, so I definitely recommend a hike here in June or July. Several trails converge as you approach the Willow Heights Lake. One trail travels back down through the meadow a different way. The other two trails (one to your right and one to your left) are part of the loop trail that goes around the lake. This loop is overgrown in some areas, only travels next to the lake for a short time, and will add 0.65 miles to your hike. To get the best view of the lake, take a left as you reach the end of the meadow where the trail splits and stay close to the tree line. This part of the trail will take you right up next to the water and provide some great pictures. This area is in the heart of the Salt Lake Watershed, meaning there is no swimming allowed in the lake and no dogs allowed on the trail. Take a look at these beautiful wildflowers we saw along the trail! From Salt Lake City, take I-215 east and exit at 6200 South toward the ski resorts, exit 6 (don’t use the Exit Only lane). Take a right onto Wasatch Boulevard and travel south until you reach Fort Union Boulevard (7200 South). You will see signs for the Brighton and Solitude Ski Resorts, as well as Big Cottonwood Canyon. Turn left and head up the canyon for about 11 until you reach the Silver Fork Lodge on your right. This is the tricky part. Approximately 0.3 miles past the Silver Fork Lodge, on the left side of the road, is the start of the trail. No parking lot or signs mark the start of the trail from the road. You will see dirt pullouts on both sides of the road for parking and a rock that says Willow Heights Conservation Area a few steps up the trail from the parking. This is the Willow Heights Trail. If you are driving and you reach the Solitude Mountain Resort, you have gone too far! The Curves Ahead sign pictured below shows where the trail starts, but can only be seen as you are heading DOWN the canyon from the other direction. What do you look for in a good trail? Let me know in the comments below! I love this hike! The lack of crowds is my favorite aspect of this hike. I would also recommend hiking this in the fall – the yellows are amazing. Oh – and bring bread for the ducks. Now that I’ve done this hike and know how great it is, I want to go up there for all 4 seasons. Good tip about the ducks! Do you think this trail would be okay in the spring? I’m wanting to do it in next week, but I don’t want to hike through snow!